Mikhail Doroshevich According to a recent survey conducted by #DB3 research company in January 2019, the aggregated audience of 6 web sites of Russian television channels totals 474 thousand people (aged 15-74) using PCs to access internet. The 6 sites are: 1tv.ru, ren.tv, vesti.ru, ntv.ru, tnt-online.ru, russia.tv. If we compare their audience with the news sections of Belarusian portals, then only the news sections of tut.by (1.14 million) and onliner.by have a larger audience. The aggregated audience of Russian television channels is larger than the audience of the news section of Mail.ru - 438 thousand and Yandex.by - 384 thousand people. The closest, audience-wise, Belarusian news resource kp.by has an audience of 302 thousand people. 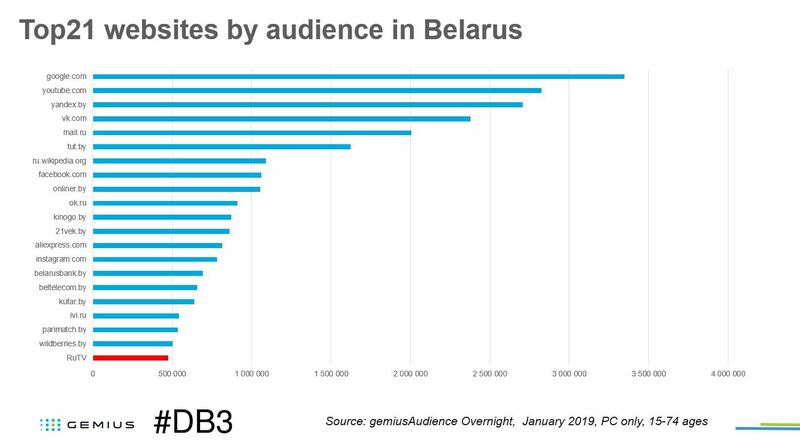 Let’s compare socio-demographic characteristics of aggregated Belarusian audience of these six sites and of the general Belarusian internet audience (again, aged 15-74 years, accessing internet via PCs).